The versatility of modern post frame construction is undeniable. As the engineering, technology, and materials have evolved, post frame construction has become a sensible and economical option for a broad range of uses. No longer merely an excellent choice for solely agricultural applications. Post frame construction is used extensively for many types of structures. For example, municipal offices, fire stations, churches, schools and annexes, warehouses, manufacturing, retail stores, equestrian buildings, and even personal residences. One principal advantage of post-frame construction is the ability to build with wide open interiors without obstructions caused by several load-bearing columns and walls. As a result, large vehicles and equipment can be moved into and out of the structures without unnecessary maneuvering or disassembly. In retail and manufacturing, the open areas eliminate vision-blocking barriers and allow production lines to operate in minimal space. 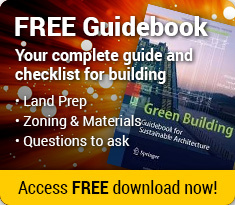 Selecting the appropriate ingress and egress demands of the building is an essential step in the building design process. Openings and doorways must be as wide as needed for access by large vehicles, equipment, and delivery of supplies or inventory. When heavy equipment is involved, the design should address elements such as load limits on flooring and surfaces entering the doorway. What will be dimensions of the largest vehicles or equipment that will move into and out of the building? For those very wide or heavy vehicles and equipment, orient the building entry in a direction that allows for easy, unobstructed access without excessive maneuvering. Is the load limit of the exterior access and interior floor sufficient to maintain the potentially heaviest weight? Will there be a sufficient number and proper placement of doorways for every occupant to escape quickly in an emergency? Does the climate involve significant snow or endure extended periods of frigid temperatures? In many areas, clearing snow and ice frequently may be necessary. In cold weather, you may also choose to install a quick-response door system that saves energy within. Need a large doorway? there are three options, although variations of these are possible. The most common options are sliding doors, overhead doors, and hydraulic doors. Sliding door systems may be a single door opening right or left. Or alternatively, double doors that move in opposite directions. These doors operate manually. But consider the amount of time it takes to operate if the doors require frequent use. Sliding doors are the least expensive of the three options requiring less complicated engineering, easier installation, and less energy consumption. Additionally, If the weather involves considerable ice and snow, continually clearing exterior sliding tracks can be a time-consuming endeavor. If interior space permits, mounting the doors and tracks inside of the entry is a better choice. Overhead Doors that open and close vertically like a typical garage door is a very convenient option. While smaller doors may open manually, large doors, up to 36’, require electronic operations that can be triggered when a vehicle nears the entry or through a remote-control system. These are not as susceptible to ice and snow as sliding doors are. Hydraulic & Bi-fold Doors are a heavy-duty option for large doorways, typically used for airplane hangars and other large vehicle entry. The doors are hinged at the top and open outward and upward, powered by robust hydraulic systems. The doors can be a solid piece or bi-folds. Many vehicle repair shops and agricultural equipment storage use these systems. When opened, the door itself provides additional covered workspace. Pacemaker Post Frame Buildings Offers Design and Construction Ideas. 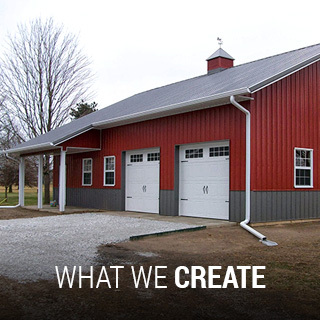 Headquartered in N. Webster, Indiana, Pacemaker Post Frame Buildings has been assisting in the design, engineering, and construction of modern post frame buildings for municipal, agricultural, civic, equestrian, and residential buildings in the Midwest for 40 years. To view some of Pacemaker’s outstanding finished projects in every segment of their business, visit the Pacemaker Gallery’s “What We Create” section to learn more. 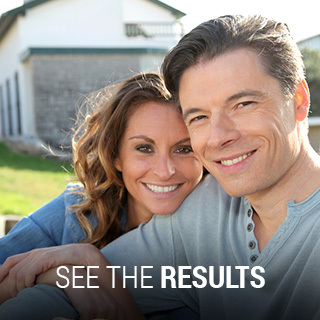 Also, visit Pacemaker’s Contact Page to learn more. 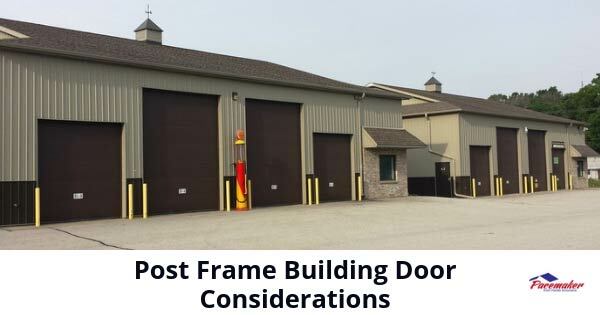 This entry was posted in Post Frame Buildings and tagged design features for post frame buildings, doors for post frame buildings, post frame buildings on February 12, 2019 by Jack Cripe. Beautiful and functional post frame buildings have many uses. 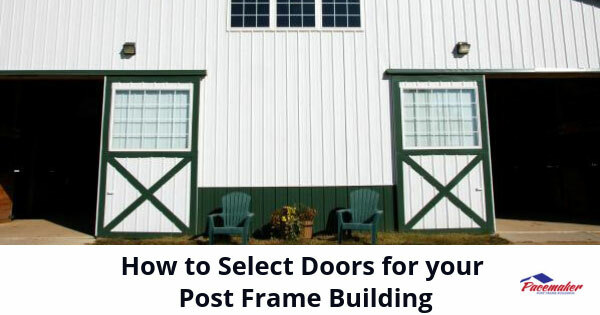 Today, post frame construction is commonly used for agricultural buildings, auto repair shops, equestrian centers, fire stations, retail outlets, churches, schools, warehouses, and more. Post frame buildings are ideal for many applications. As a result, selecting the right doors varies from project to project. The primary consideration for entry and exits to any building is the size of the objects that must pass through. For barns, repair shops, or warehouse, access must allow easy entry by large vehicles. Tractors, automobiles, trucks, and loaded forklifts may also be able to enter and egress easily. Fire stations must allow quick and the efficient exit of massive fire engines. Equestrian centers must have entries large enough to allow horses and riders to enter and leave safely without obstruction. Creating a doorway that is wider and taller than the largest object to ever pass through is always the necessary solution. Another factor to consider, in most instances, is the preservation of energy. While what passes through will influence the dimensions of the doorway, energy savings issues may determine the type of door to be installed. For example, overhead doors have inherent advantages in that their operations are not affected by snow and cold weather. The doors rise instead of needing to push against accumulated snow. The tracks are inside and will not tend to freeze. However, sliding doors can be set to open longitudinally only as far as is needed, thereby reducing energy consumption. Since “big” doors may only need to operate when needed, smaller service and “man” doors can be scattered throughout the building where required. These help to preserve energy loss from the working areas. Double doors of various sizes can enable easy access of smaller units through one side while the opposite side remains closed. This will preserve energy in the post frame building. When larger objects pass through, both sides may be opened. Similarly, bi-fold doors may be opened only as far as needed for easy entry or egress. 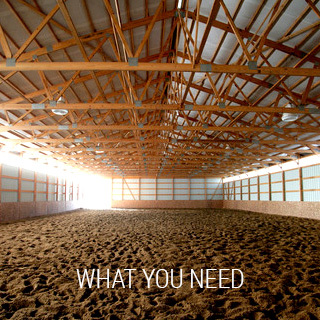 Because of the clear, uninterrupted space within, post frame buildings are perfect for agricultural and equestrian buildings. Dutch doors are very popular for housing animals because the upper section may be open to permit air and light. The lower part stays closed to keep animals from escaping. 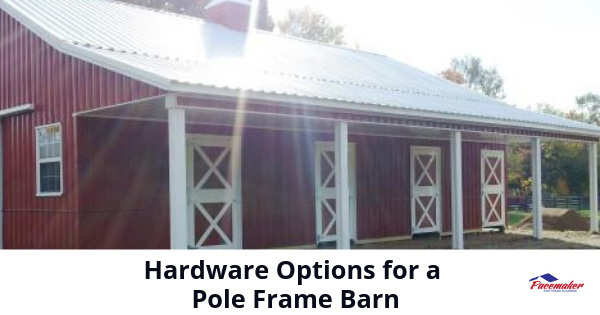 Dutch-style doorways have long been preferred for horse barn applications. One notable advantage regarding doorway placement or any subsequent changes is the eight-foot spacing of post frame’s vertical beams or posts. Additional doorways can be added without requiring substantial modifications to the building’s framing structure. Pacemaker Post Frame Buildings of North Webster, Indiana, has been a standard setter in post frame construction for over four decades. The experts at Pacemaker have been involved in the design, manufacture, and construction of thousands of post frame buildings of every type from industrial and agricultural to municipal, civic, retail, residential, and more. Visit Pacemaker’s website gallery to view the many applications of beautiful, economical, and functional buildings. Also, you can learn about their process, financing options, and what to look for in a competent post frame building supplier and builder. The Pacemaker experts can guide your project from concept to completion, collaborating to ensure all expectations are met. For questions about any phase of post frame construction, contact the professionals at Pacemaker Post Frame Buildings. To do so, either complete the website’s Contact section or by calling (888)-834-4448. This entry was posted in Post Frame Buildings and tagged design features for post frame buildings, doors for post frame buildings, post frame buildings on January 22, 2019 by Jack Cripe.